Research indicates progeria is comparable to normal aging with respect to cellular signaling pathways. What are the similarities and what can we learn from them? What are progeria and Werner's syndrome? What do primary care physicians (PCPs) need to know about these and other rapid aging syndromes? (See the chart below.) 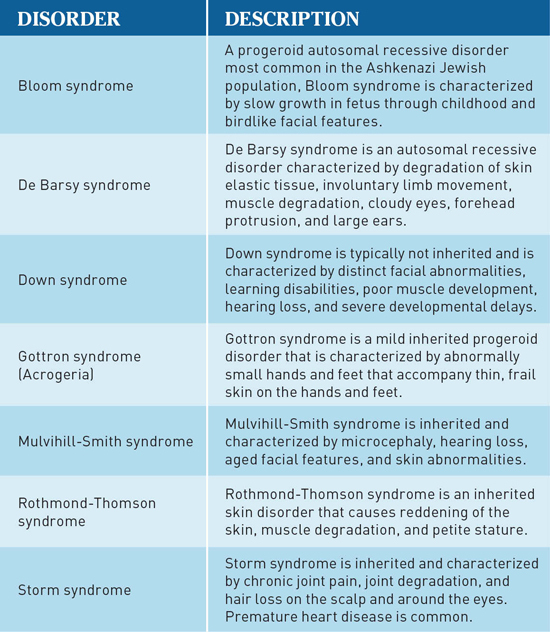 This discussion focuses exclusively on the rather rare progeria disorder and the somewhat more frequent Werner's syndrome. As both syndromes are uncommon, in both cases, PCPs should be aware of the at-risk population, characteristics and symptoms, complications, current types of treatment, resources, and referral options and potential assistance for patients and families. Even though the progeroid population is technically at higher risk for anxiety and depression due to the severity of the disorder, both disorders' comorbidities are relatively lower than the normal population. Patients with Werner syndrome are at higher risk for developing anxiety and depression compared with HGPS patients. This associated risk increase results from the Werner syndrome patients' longer life expectancy and their remaining asymptomatic for a longer period of time. However, comorbidity is low. Primary treatment models exist for HGPS,2 although that is not the case for Werner syndrome. The aim of progeria treatment for PCPs should be to reduce the risk of comorbidity developments, assess the progression of the disorder, treat comorbid symptoms, and assess the progress of the current treatment. PCPs must conduct routine visits, blood work, and dietary assessments. Constant physical assessments are key to assessing both treatment efficacy and disease progression. Since it is not uncommon for progeria patients to develop severe physical and debilitating complications in less than a few months, check-ups must be performed monthly. Farnesyltransferase inhibitors (FTIs), the drugs of choice for HGPS, slow the progression/mutation of the cells.2 However, no drug therapy exists for Werner syndrome. Blood levels should be monitored on FTIs just as other chemotherapeutic drugs. Vitamin supplementation may be necessary and helpful to aid the antioxidant system and to maintain bone and skin health. Other drugs for symptom relief may be used. However, screening for drug interactions first is necessary to avoid complications. Identifying risk factors for progeria development is important for the PCP. Lack of a growth spurt in the teenage years should be the first risk factor for Werner syndrome.4,5 Family members of patients with Werner syndrome should consider that the defective WRN gene may be present, leaving them at greater risk. HGPS can be identified in children of 24 months with impaired growth and facial development. PCPs must remember that progeria patients have many psychosocial needs that can easily be ignored due to the medical complexity of the syndromes. The psychosocial issues all children and teens encounter as they age are the needs to be socialized, educated, and to grow emotionally. In many situations, individuals with various conditions and diseases such as progeria, Werner's syndrome, learning disabilities, and intellectual disabilities can and will develop as they cultivate a zeal for interests such as sports, singing, Star Wars, The Wizard of Oz, painting, and dancing. It is imperative that parents, PCPs, teachers, and institutions recognize and respect patients' passion without denying it or depriving an individual of those experiences. In fact, these patients should be encouraged, supported, and even assisted with the environmental, educational, and emotional adaptations necessary to allow them to pursue their passions, as this may be the one area in which they are highly proficient or may even excel. Individuals who have acquired or are at risk for a condition that would necessitate medical, educational, or psychological intervention should not receive treatment or interventions at the cost of their passions. Individuals with progeria or Werner's syndrome should be permitted to pursue their passions despite the syndrome. At the least, passion is comparable to treatment and in some cases, can be even more important. If the medical profession cured the syndrome, the individual could be left with improved health and not much else if passions have not been nurtured. The power of passion should not be minimized, as it is the drive that keeps individuals going and the energy behind happiness that enables them to experience life to the fullest extent. Other than PCPs, who supports patients and families with a rapid aging syndrome? Professionals who are knowledgeable on topics that assist patients in meeting their activities of daily living (ADLs), instrumental ADLs (IADLs), and recreational pursuits are crucial. Occupational therapists, physical therapists, and recreational therapists can address many of the problems by reducing ambulation road blocks, customizing interventions, and adapting the environment to enable individuals with progeria and Werner's syndrome to provide for their own ADLs, IADLs, and recreational needs. Support groups can offer empathy, universality (not the only parent with a child in this situation or the only person with this syndrome), and altruism, which aid and comfort those with the syndrome as they help others with the syndrome to meet the demands of life while instilling hope. The role of the PCP is to educate, furnish support and medical care, and provide hope. Without hope there is no future, and these individuals have a future. Despite the darkness, new discoveries and medical interventions may brighten the future. 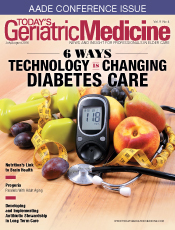 — James Siberski, MS, CMC, is an assistant professor of gerontology and the director of the geriatric care management graduate certificate program at Misericordia University in Dallas, Pennsylvania. He is also an adjunct faculty member at University of Scranton. — Shawn P. Dziepak, an undergraduate student at Misericordia University, is pursuing a BS in medical science and a BA in biology with minors in advanced clinical nutrition, chemistry, and psychology. He is involved in research pursuits in the field of biochemistry with Charles Saladino, Jr, PhD, of Misericordia University. — Carol Siberski, MS, CRmT, C-GCM, is a geriatric care manager in private practice and participates in research in geriatrics and intellectual disabilities in Pennsylvania. 1. Dyer CAE, Sinclair AJ. The premature ageing syndromes: insights into the ageing process. Age Ageing. 1998;27(1):73-80. 2. Progeria Research Foundation. The Progeria Handbook: A Guide for Families & Health Care Providers of Children with Progeria. Peabody, MA: Progeria Research Foundation; 2010. 3. The science behind progeria. Progeria Research Foundation website. http://progeriaresearch.org/the_science_behind_progeria.html. Accessed March 2016. 4. Friedrich K, Lee L, Leistritz DF, et al. WRN mutations in Werner syndrome patients: genomic rearrangements, unusual intronic mutations and ethnic-specific alterations. Hum Genet. 2010;128(1):103-111. 5. Werner syndrome. Genetics Home Reference website. https://ghr.nlm.nih.gov/condition/werner-syndrome. Updated December 2012. Accessed March 2016. HGPS is an accelerated aging disease typically caused by a de novo mutation leading to autosomal dominant single base substitution in the Lamin A gene. The expression of this mutated Lamin A gene results in a truncated protein known as progerin. In HGPS there is an excessive accumulation of progerin that is toxic to cells, causing DNA damage and genomic instability. Since normal lamins participate as relays for intracellular signaling pathways in the nucleus and interact with chromatin, its mutated version, progerin, can have serious implications in normal aging and disease. The team of scientists used GeroScope to analyze and compare microarray datasets from replicatively senescent cell lines, cohorts of normally aging individuals, and individuals with HGPS. Analysis of 65 major cellular signaling pathways revealed that signaling pathway activation states in fibroblasts derived from chronologically young HGPS patients strongly resemble those taken from normal middle-aged and old individuals. Antonei Benjamin Csoka, PhD, CEO of Vision Genomics and an assistant professor at Howard University, says, "Although progeria is primarily caused by accumulation of progerin, we believe it truly represents accelerated aging. That is because what we commonly refer to as aging is a macroscopic effect rather than a cause. For example, shortening of telomeres can be a cause of aging, damage to mitochondria can be a cause of aging, aneuploidy can be a cause of aging, stem cell depletion can be a cause of aging, and so forth. All of these microscopic cellular pathologies, and more, can be causative in normal aging, and what we call aging is the macroscopic consequence or effect of these incidents that we define as cause. In progeria, the progerin accumulation component is dramatically increased, but our results show that progeria nevertheless represents aging at the effect levels of cellular senescence and organismal aging." GeroScope analyzes gene expression datasets from multiple platforms with low error rate and has the ability to elucidate and precisely define altered features of intracellular regulation using mathematical computations. The results are noted as pathway activation strength (PAS) values, where positive and negative PAS values indicate pathway up- and down-regulation, respectively. Alex Aliper, coleader of the study, says, "We divided our analysis into two phases: In phase 1, we analyzed the pathway changes during increasing cell passage number representing in vitro cellular senescence, and we found an increase in cellular pathway activation with increasing number of passages. We call this the "Pathway Activation Drift." In phase 2, we analyzed pathway changes in different age groups (chronological aging) as well as progeria patients. We found that signaling pathways activation in chronologically young patients with progeria strikingly resembled normal middle-aged and old individuals rather than normal young individuals." With the findings from phase 2 analysis, the team could conclude that HGPS actually represents accelerated aging rather than being a mere simulacrum of aging. Further, HGPS, middle-age, and old-age groups share 13 similarly activated signaling pathways. Specifically, AR, IGF1R, HGF, HIF1A, IP3, PAK, SMAD, TNF, and TGF-beta main pathways are up-regulated, whereas the mitochondrial apoptosis pathway is down-regulated. Thus, this study clearly demonstrates that the process of aging and the pathophysiology of the accelerated aging syndrome HGPS are regulated through similar signaling pathways. Some of the significantly altered pathways that reveal the similarity between progeria and normal aging are the caspase cascade main pathway, growth hormone main pathway, MAPK main pathway, and transcription main pathway. Some of these altered pathways have a major effect on DNA repair and chromatin organization in particular. The results from this comparative study suggest potential pathways that could be targeted to develop drugs and drug combinations for HGPS as well as normal aging. The broad message behind this initiative is that cellular aging is the precondition for anatomical aging, and the overall aging phenotype of the organism is the final outcome of cellular aging. With this initial step toward studying and comparing aging and aging-related diseases, the team plans to study Werner syndrome, Bloom syndrome, and xeroderma pigmentosum in order to identify common aging PAS patterns.